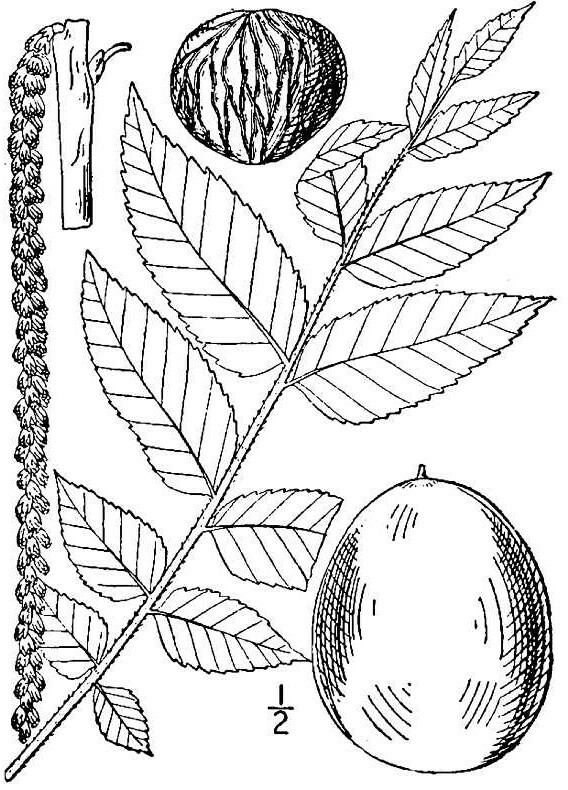 Black Walnut (Juglans nigra). 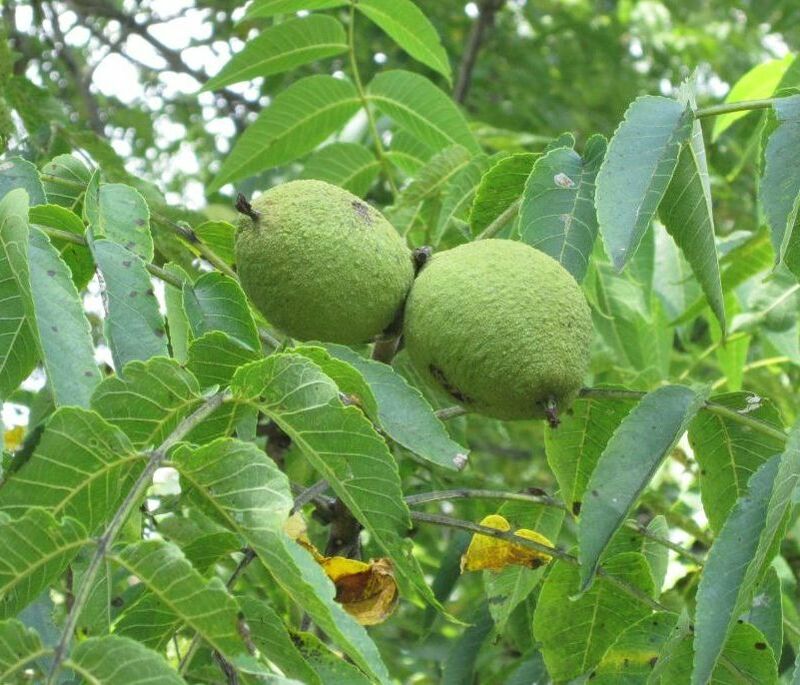 The nuts from the Black Walnut are one of the best tasting wild nuts there is. In my own opinion, after Hickory nuts, these are the best tasting nuts, period, though some would argue the closely related Butternut is tastier. I think this is a great tree to grow for food. They will start to produce nuts after about five years or so, and heavy crops after they are about 20. Planting: Small trees can be transplanted, but this tree grows quickly from the nuts, and that is a lot less work. They are very reliable to sprout from the nut. You want to plant them about 5-7.5 cm (2-3 inches) deep, back fill the soil, tamp down and leave. There is one problem with this - squirrels. They will smell them and dig them back up. After you plant the nut, fill the hole half way up with soil, and put on a few moth crystal flakes, and cover up the rest of the soil and tamp. Instead of moth crystal flakes, you can use freshly ground black pepper, or a crushed garlic clove. Do it the same way with whatever one you choose - half cover, put on your choice, and put the rest of the soil on, and tamp down. Or, you could just pee on the spot after you plant it - that is the universal animal way of saying to other animals to leave this spot alone, and it is free. I'm sure there are other things you could do, but at least you get the idea that you need to do something. You need to remove the outer green husk from the nut before you plant. 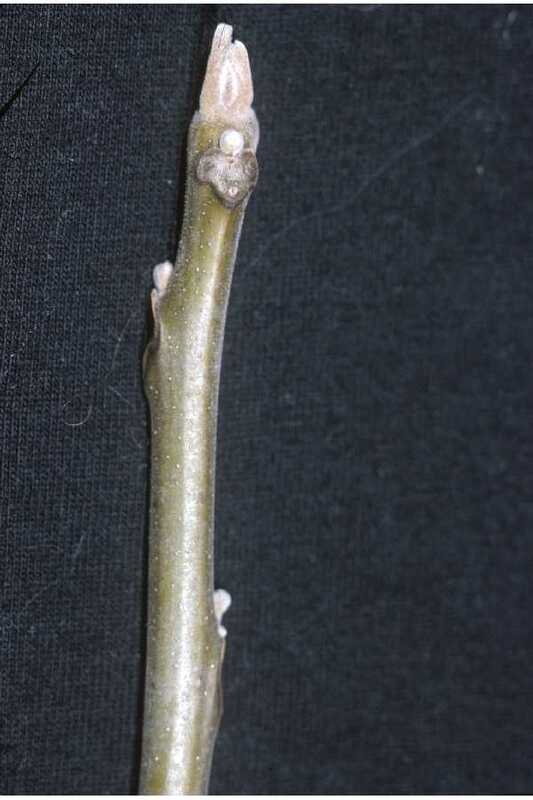 If you plant in the fall, the nut will go through the needed freezing and thawing cycles. If you are going to plant in the spring you will need to simulate a winter yourself. Put the nut in the freezer for the winter. In the spring take out for a day or two, put back in the freezer. You will need to do this at least a couple of times. After the soil has fully thawed, plant as above. They are fun to watch grow after they come up, as they do grow quickly. Soil & Site: This tree can grow in clay to sandy soil, but the best growth will be in deep, organic rich loam with adequate moisture but not standing water. This tree does not like acidic soils - it wants a pH of 6.5 to 7.5. This tree should be planted in an area where it has lots of space to spread out over the years. It will inhibit the growth of Tomatoes, Potatoes, and any other Nightshade family plants under them, so don't choose a site close to your vegetable garden. 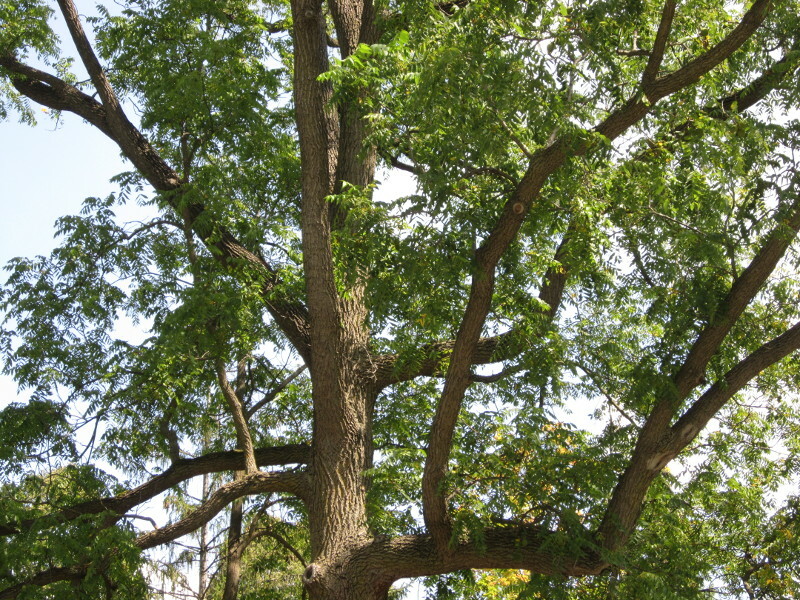 Maintenance: If you want the tree to grow much faster, and produce more nuts, sooner, fertilize every year with a fertilizer that is high in phosphorus. Rock phosphate fertilizer spread around the ground under the tree is a great way of doing this. That, and some composted manure, then a layer of mulch will make the tree grow very fast. Do not create a mound of mulch at the base of the tree. Putting leaves from other deciduous trees around it each fall will help it too. Harvesting: They are ready to gather as soon as they hit the ground sometime in October. The husk of the Walnut is an ordeal to get off, and you get covered in a brownish yellow dye that can be difficult to get rid of, and the smell, while I like it, some find quite unpleasant. Often the husks are wormy, but that does not seem to affect the nuts themselves. I have tried many ways of getting the husks off, wet, dry, cutting them, rubbing them and none seem easy. I suggest just trying different ways, and see what works best for you. There are many suggestions I've seen on the internet, some look interesting, one seems dangerous - the car one: The suggestion is to drive over them. I did this once, and one that I guess was on the edge of the tire shot out sideways like a bullet. Go here to see what others have come up with. Using: Once husked, these are basically the same story as Hickory nuts, in that they need to be cured for a few weeks in a dry place, such as near a furnace to taste their best. They are very hard to crack open, and for the most part use the instructions for the Hickory nuts to get at the meat. I have read about soaking them overnight in warm water before you crack them, but have to confess I've never tried it, so I can't comment on whether it works. I have my own method that works well - see the Hickory nut section. Great just for eating as you crack them, or used in baked goods. They will keep for a few years in a dry, dark spot, and for many, many years in a freezer. Fruit: Green-brown, spherical husk, just bigger than a golf ball, with strong distinct smell when bruised or scratched, ripe in October, with deeply grooved, very hard shelled nut inside with very tasty, strong flavored meat. 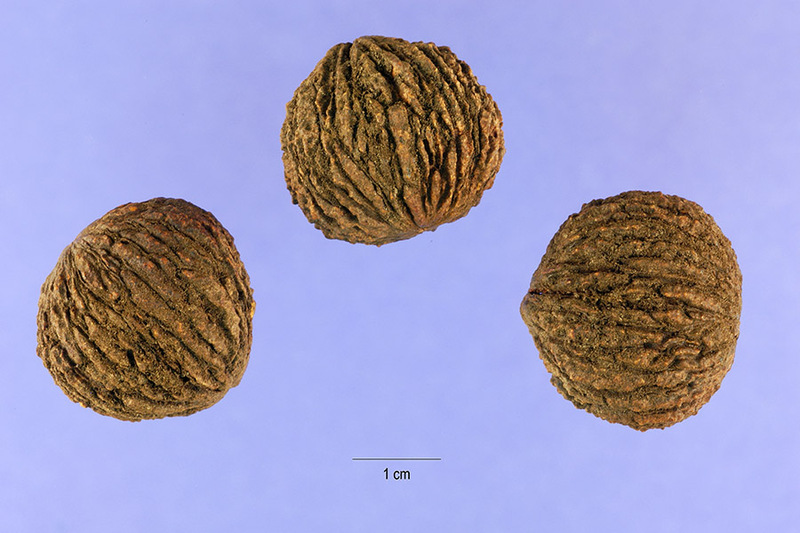 Black Walnuts (Juglans nigra) range. Distribution map courtesy of the USGS Geosciences and Environmental Change Science Center, originally from "Atlas of United States Trees" by Elbert L. Little, Jr. .
Black Walnuts in late August. They will fall to ground when ripe.